Tutorial: What’s the Deal with Sus4 and Sus2 Chords? A good chord progression is all about building tension and releasing it. Which makes the mysterious and unsettled suspended chords, sus2 and sus4, so effective in a progression. This post should demystify them a little. Giving you ideas for when to use them, how to play them and why they work so well. Suspended chords are neither major nor minor which makes them sound unfinished. Sus4 chords particularly have a bright, restless feel to that pushes a chord progression forward. 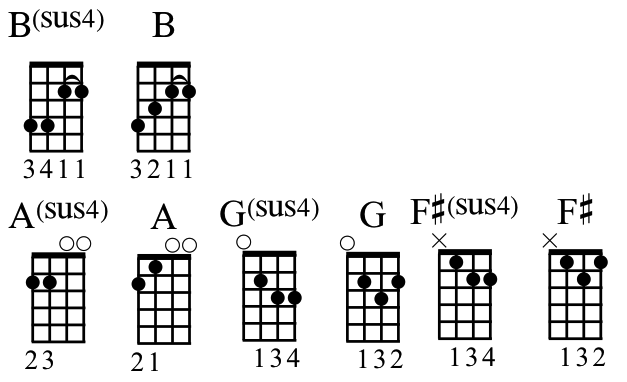 The first example feels wrong because the Csus4 demands the C chord comes to the rescue to end the progression. It fuels the progression with momentum. 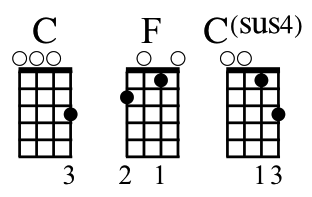 This move from a sus4 chord to its major chord is the most common use of the suspended chords. A classic example is The Who's Pinball Wizard which starts with a repeated move between Bsus4 and B then continues with a series of sus4 chords resolving into their relative major chord. Another favourite of mine is Keston Cobblers' Club's fantastic Pett Level that uses both Csus4 and Gsus4. Sus4 chords create enough tension that just switching between the sus4 chord and the major chord you can just hang out and do that for a while as Queen do in the intro to Crazy Little Thing Called Love. And as ABBA do in Dancing Queen when they switch between A and Asus4. In this example I'm using the 2013 inversion of F which means the A-string, 3rd remains constant through the chord changes. Giving the progression continuity. Sus2 is very similar to sus4 in that it is neither major or minor. But it is much more mellow than sus4. To the point where it's almost melancholy. Amanda Palmer uses it to similar effect on Bigger on the Inside this time moving from Gsus2 to G.
If you've really been paying attention you might have noticed that Fsus2 and Csus4 are exactly the same chord (0013). Similarly, the chord shape for Asus4 (2200) is exactly the same as Dsus2. So, for example, the A – Asus4 move in Dancing Queen could also be thought of as an A – Dsus2 move. Every sus2 chord has a twin sus4 chord (and vice versa). That gives suspended chords another layer of ambiguity. Not only are they not major or minor but also you can't be sure what chord they are. C on the open C-string and A-string, third fret. E on the open E-string. G on the open G-string. Since the uke has four strings and major chords have three notes you can double up one of the notes in the chord. It doesn't matter which so it's usually the one that's easiest to play. Suspended chords do exactly what they say on the tin. They take out the third note in scale and replace it with the fourth note in sus4 and the second note in sus2. So Csus4 will take out the E and replace it with an F. You can play that just by adding the E-string at the first fret to the C chord. Csus2 will replace the E with a D. That's a bit more tricky to play. First you need to get rid of the open E-string. You can do that by playing it at the third fret (a G note) then add a D by playing the C-string at the second fret. D on the C-string, second fret. G on the open G-string and E-string, third fret. And, of course, the Csus2 chord shape is the same chord shape as Gsus4.